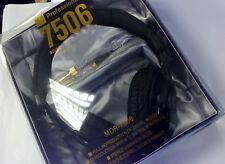 SONY MDR7506 Professional Studio Headphones: MDR-7506. Supplied Soft Case: Protective storage. Stereo Unimatch Plug: 1/4" and 1/8" applications. Closed-Ear Design: Comfort and reduction of external noise interference. Standard Stereo Mini Plug. 1/4" Adapter Included. Patented Varimotion Speakers. Single-Sided and Coiled Cables. History of beyerdynamic. beyerdynamic DT 770 Pro Studio. With an impedance of 250 ohm, the DT 770 PRO headphones are perfect for mixing in the studio. Handcrafted in Germany the DT 770 PRO is ruggedly built to last, yet lightweight and comfortable to wear over long periods. With outstanding bass response and clean, clear highs, SR850 ensure complete comfort and accurate monitoring performance. Self-adjusting headband for secure and comfortable wearing; 1/8" to 1/4" gold plated plug for different devices. TECHNICS DETACHABLE COILED CORD : PART NO. 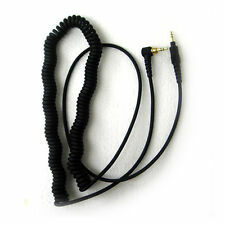 It's compatible to Technics detachable coiled cord for headphones as model below ;. Defected goods, Lost will be fully responsible. With outstanding bass response and clean, clear highs, SR850 ensure complete comfort and accurate monitoring performance. Adopts 50mm drivers, with high sensitivity, wide response range and large dynamic. The stylishNumark Red Wave Carbon DJ Headphones feature 50mm drivers for full-range sound and an optimum frequency response of 15 Hz to 20 kHz. High-quality, full-range headphones designed for DJs. We attribute our success to our competitive pricing and to our high standards of honesty and integrity. Beyerdynamic DT 770 PRO Closed-Back Studio Headphones for Mixing, 80-ohm. They reproduce the entire frequency range with incredible precision, and even reproduce low frequencies in punchy detail. For decades now, professional users all around the world have placed their trust in our classic range: DT 770/880/990 PRO. NUEVO Audio Technica ATH-PRO 500 MK 2 RD rojo | Auriculares de DJ Monitor de Japón. Type Sealed DJ monitor Headphones. Se unen dos tipos de código de tipo de que se puede utilizar según el objetivo. Todos los artículos tienen garantía de un año. The modern audiophile sound signature is the winner of 20 Editors' Choice Awards, including CNET & Voted #1 Headphones by DJ Mag back to back. Crossfade M-100. Why Crossfade M-100?. Personaliz3d Headphones. And the pro-grade materials are durable, yet comfortable. Find out why online reviewers, top audio engineers, and cult followers agree, M-Series is an unmatched combination of audio and build-quality that gets the job done. The result is a comfortable listening experience that you’ll continue to enjoy during long sessions. And the HD9 is built tough so you can rely on it wherever your travels take you. The HD9’s closed-back acoustic design provides superior listening isolation and reduces headphone bleed, so you hear nothing but music—and your housemates hear nothing at all. (1) Presonus HD7 Professional Studio Monitoring Headphones Semi-Closed Back. #1 Authorized Presonus Internet Dealer! Features Summary of HD7 (1) Rockville BTH5 Wireless or Wired Bluetooth Headphones, Foldable Detachable Cable. "Great Bass, 50mm Transducers, Largest in Class !!!" Sennheiser HD8 DJ Headphones -. Sennheiser HD8 DJ Overview. TheHD8 DJ Headphones fromSennheiser feature an emphasis in the mid-low end and are designed for use in live DJ applications. Intended to provide a comfortable fit during extended sessions or performances, the HD8s include a pair of velour ear cushions and a pair of leatherette ear cushions. HIT MAKE OFFER BUTTON FOR THE CHEAPEST PRICE!!! SENNHEISER HD25. The HD 25 Headphone from Sennheiser provides high-quality audio in a lightweight and improved design. It can be used in several applications for monitoring, recording, DJing, and more. Beyerdynamic DT 770 Pro closed studio headphones provide professional-quality sound for critical listening applications. Built to last and perform reliably, DT 770 headphones make a great addition to any studio. Authorized Beyerdynamic Dealer! Beyerdynamic DT 770 Pro 32 Ohm Dynamic Studio Headphones. Closed, diffuse-field studio headphone. Including drawstring bag. 32 O version. . . . . . . . . . . The M-Series ATH-M40x professional monitor headphones are tuned flat for incredibly accurate audio monitoring across an extended frequency range. Audio Technica ATH-M40x Closed-Back Studio Monitor Headphones. Live Sound. Whether it be about a warranty, connectivity, of if this is the best item for you. Helpful Links. This also does not apply to Headphone products or parts as it can be a health hazard. If we can't replace it we'll set you up with the manufacturer for a repair. Opción de envío gratis no se aplica a direcciones en Alaska, Hawai, Puerto Rico, Guam, Palau y las Islas Vírgenes, y la dirección de APO / FPO, o cualquier otra dirección fuera de los 48 estados más bajos. The AKG K141 MKII semi-open headphones give you great sound and comfort, and they're ideal for studio monitoring. These headphones feature both leatherette and velvet earpads. The AKG K141 MKII phones include a detachable 10' straight cable and a 16' coiled cable. Authorized Beyerdynamic Dealer! The DT 770 PRO is a closed dynamic headphone and has been designed for critical music and sound monitoring. The single sided cable makes the handling of the headphone easy. The result is a comfortable listening experience that you’ll continue to enjoy during long sessions. And the HD9 is built tough so you can rely on it wherever your travels take you. 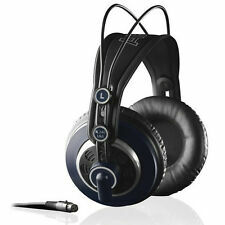 (1) Presonus HD9 Professional Closed-back Studio Reference Monitoring Headphones. AKG K553 MKII is the ideal closed-back, over-ear studio headphone for monitoring, mixing and mastering. Extra-large soft ear pads ensure stress-free listening over long sessions. Item Code: K553 MK2 U.
Velour cushions, 50mm drivers , 10Hz to 30kHz, 32 ohm ! The K702's are reference, open, over-ear studio headphones for precision listening, mixing and mastering. This is achieved by using revolutionary flat-wire voice coils and a patented Varimotion two-layer diaphragm. The K240 Studio professional over-ear, semi-open studio headphones are designed for professional applications such as mixing, mastering and playback. Classic cans for precision listening, mixing and mastering. The ATH-M50xBT Wireless Over-Ear Headphones from Audio-Technica features sound reproduction from 45mm large-aperture drivers with rare-earth magnets, and copper-clad aluminum wire voice coils. Together, they are designed to provide both clear audio and rich, deep bass. We strongly suggest that you check your order after receiving it to be sure that it is in proper working order. You can feel confident when purchasing from eStudioStar. After that period, you will have to work directly with the manufacturer for warranty service. Sound Isolating sleeves provide a customized fit. Shure SE215 Headphones: Sound Isolating Design. Shure SE215 Headphones: Detachable Cable with Wireform Fit. Shure SE215 Headphones: Ergonomic, Professional Design for Unmatched Personalization and Comfort.